Spanning much of the eighteenth and nineteenth centuries, the novel follows the fortunes of the extraordinary Whittaker family as led by the enterprising Henry Whittaker–a poor-born Englishman who makes a great fortune in the South American quinine trade, eventually becoming the richest man in Philadelphia. Born in 1800, Henry’s brilliant daughter, Alma (who inherits both her father’s money and his mind), ultimately becomes a botanist of considerable gifts herself. As Alma’s research takes her deeper into the mysteries of evolution, she falls in love with a man named Ambrose Pike who makes incomparable paintings of orchids and who draws her in the exact opposite direction into the realm of the spiritual, the divine, and the magical. Alma is a clear-minded scientist; Ambrose a utopian artist but what unites this unlikely couple is a desperate need to understand the workings of this world and the mechanisms behind all life. The story is peopled with unforgettable characters: missionaries, abolitionists, adventurers, astronomers, sea captains, geniuses, and the quite mad. But most memorable of all, it is the story of Alma Whittaker, who born in the Age of Enlightenment, but living well into the Industrial Revolution- bears witness to that extraordinary moment in human history when all the old assumptions about science, religion, commerce, and class were exploding into dangerous new ideas. So why did Gilbert write a fiction? Well, I’ve found this piece of lovely talk on Ted Talks. It’s just lovely. Of course, as usual you can borrow a copy of Elizabeth Gilbert‘s new book from Parramatta City Library. 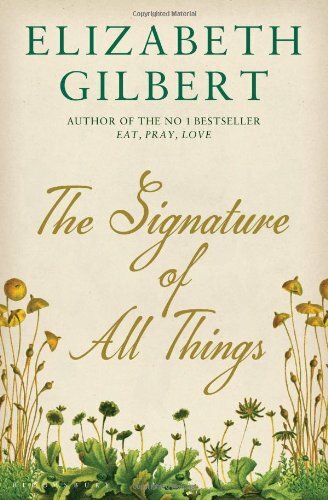 This entry was posted in Fiction, New Arrivals and tagged Author, Author Talk, book review, books, Elizabeth Gilbert, Parramatta City Library, reading, The signature of all things, Writer by admin. Bookmark the permalink.